Husqvarna’s FC250 has been teetering on the brink of greatness for years, but it always seems to be overshadowed by the KTM 250SX-F. It doesn’t matter what the Husqvarna marketing people do to separate the two brands. And it doesn’t matter what the racing team does to give Husqvarna its own identity. It doesn’t even matter what the engineering staff does to give the bike different features and components. The public perception is that the Husqvarna is just a KTM by another name. If there are any mechanical differences, people assume the bigwigs will save the good stuff for the KTM. In the past, it seems that’s usually been the case. But, is it still true today? To get the obvious facts out of the way, Husqvarna motorcycles are manufactured in Mattighofen, Austria, at the KTM factory. It has been that way since 2013. From the start, the parent company made it a high priority to give Husqvarna its own look, even if the major hardware was shared with KTM out of economic necessity. The 2019 FC250 has about the same degree of separation: it has different bodywork, an airbox that is integrated with the subframe and a number of different component suppliers. The Husky’s rims are D.I.D Dirt Stars. The hydraulic components for the clutch are made by Magura, and the handlebar is a ProTaper. The engine, frame and suspension components are the same as the KTM’s. For 2019, the Husqvarna, like the KTM, has a new frame that is stiffer in every plane. In terms of geometry, it’s almost the same as the previous year’s model, with a chromoly-steel, single-backbone design. 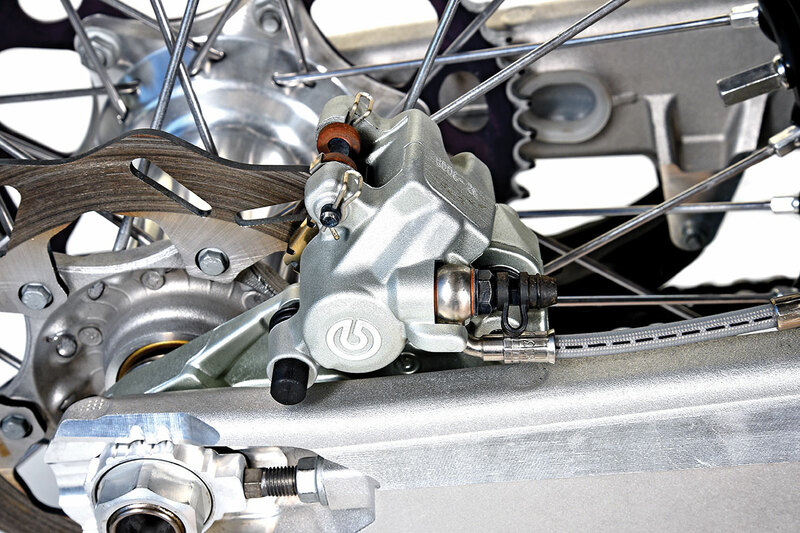 The swingarm has the same design, but the chain-adjuster slot is a little longer to give you the option of adding a link and lengthening the swingarm if that’s what you feel you need. Husky came up with new valving specs for the WP AER 48 fork and the WP shock to work with the frame’s new flex characteristics. 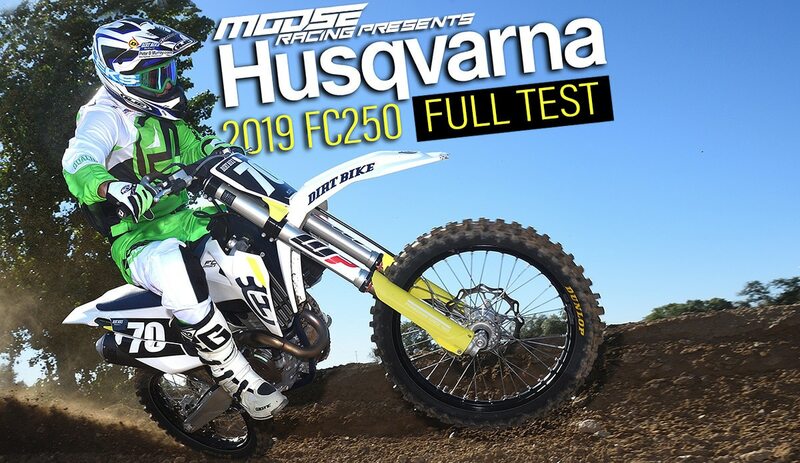 The Husqvarna FC250 is still fast and light. For 2019, there are other 250s that are fast and light. It will compete in the battleground class of the year to come. The engineers also redesigned the integrated airbox/subframe yet again. This design dates back to the Husaberg days when KTM used that brand to experiment with new ideas. At first it was heavier and more restrictive. Now, after three or four redesigns, it’s still heavier and more restrictive but less so. The most interesting result is that the airbox doesn’t necessarily result in a power loss, but it does affect the power delivery. As far as the motor itself, it’s still an electric-start, DOHC four-stroke that uses finger-followers between the cams and the valves. The biggest single change for 2019 is the clutch. It used to have a conventional six-coil-spring design. Now it has been changed to the DDS design, which has been used on the larger bikes for years. This does away with the coil springs for one big Belleville conical spring. The DDS clutch also uses rubber dampers. In general, this design results in a very different feel at the clutch lever. It actually gets easier to pull the farther it goes in. The Husqvarna still features a handlebar-mounted switch that you can use to select different power-delivery options. You can choose between two different EFI/spark advance maps, select traction control and activate launch mode from the same switch. All of those maps have been juggled and altered for 2019. The exhaust pipe, the cooling system and a number of details have also been changed, making 2019 a year of significant revision just short of a full redesign. 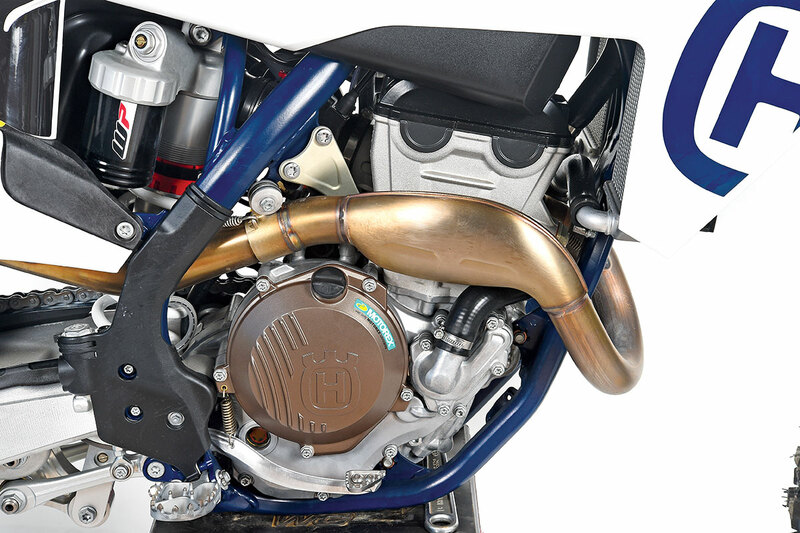 A few years ago KTM and Husqvarna changed the way we think about 250 four-strokes. They taught us to rev the bike—really rev it. All the horsepower was way up top, and if you were serious, that’s where you rode. 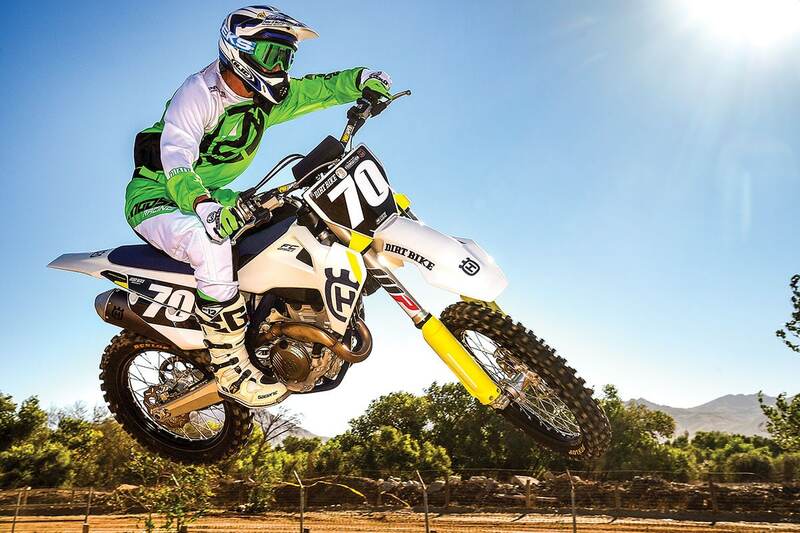 The 2019 Husky FC250 is still a revver, but it’s not as dramatic as it used to be. The bike has more low-end power than it once did, and the other bikes on the starting line have gradually become more Husky-like, with a greater emphasis on top-end power. The FC250 is still a screamer, but it doesn’t stand out so much against a backdrop of other screamers. Last year we dropped a tooth on the countershaft sprocket to help boost the FC into the meat of its powerband. Now, whether it’s because the bike’s low-end response is better or because we’ve simply altered the way we ride, the stock gearing seems to work just fine. When you scream the FC250, it’s a rocket. Rev it to the brink of disaster, then rev it a little further. If you’re not dancing with the rev limiter between every turn, you’re not trying. Now, the nice part is that if you fail, all is not lost. The FC will actually run well in the mid-rev zones. There is just no reason to ride it down there with such a wealth of power on top. The FC250 motor has fair bottom-end power, but it has so much top-end that there’s no reason to let the revs drop. This year the two maps have a little more separation. If you play Guess Which Map with a test rider, he can generally guess correctly. That isn’t to say that one is better than two or vice versa. They’re just perceptibly different without any pros or cons. Same goes for traction control. You can tell when it’s activated, but there doesn’t seem to be any point to it. The feature is more useful on the larger bikes in the Husky line that have more of a traction issue. In launch mode, however, the difference is overwhelming. We would only use it in competition after extensive testing just to get used to what it does. The hardest part is not accidentally deactivating it before the gate drops. 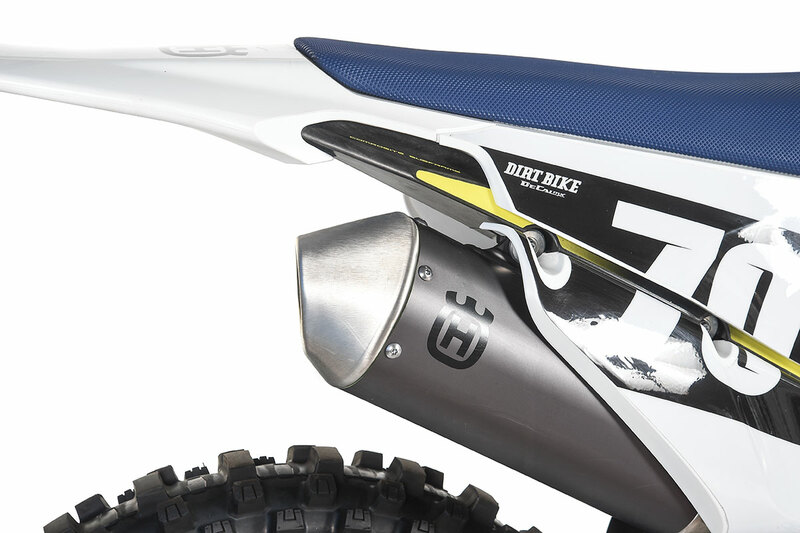 The Husky’s silencer and motor are identical to the KTM 250SX-F’s. The slight difference in power delivery is once again found in the airbox. How does the Husky compare to the KTM? Once again, the two bikes are virtually in a dead heat in real-world performance. If the two bikes leave the line together with human clones for riders, they will arrive in the first turn at the same time. Once again, they have a slightly different feel while accomplishing the exact same thing. The Husky free-revs a little slower when the clutch is in, and it hits a little more softly when the clutch is out. Because of the handlebar position and seat, the Husky seems to fit larger riders a little better. This year the most dramatic changes for both are in the chassis department. First of all, they feel much narrower and smaller than last year’s models. The new bodywork is narrower across the front, and the radiators are slightly lower. If you ride the Husky back to back with last year’s machine, the difference is obvious. As for the frame changes, you can feel them too. The new bike is clearly more Supercross-oriented. 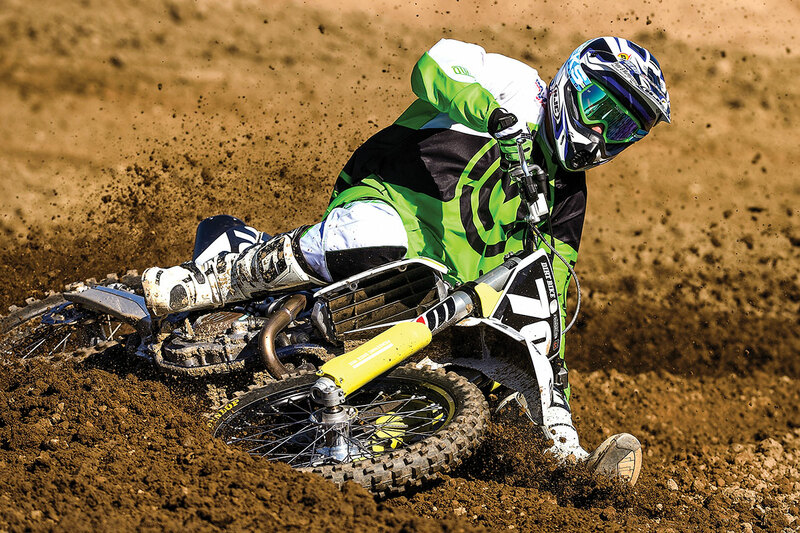 It has greater stability in stadium-style whoops, but that comes at a cost in comfort. The bike feels a little stiffer everywhere. Others have caught up to Brembo in braking performance, but there’s still none that are better. You can compensate somewhat with suspension tuning. The WP AER 48 fork is still the easiest fork in the world when it comes to making changes. Both of the damping clickers are in the right leg, and the air pressure is in the left leg. The stock settings are 15 clicks out for both compression and rebound with 10.3 bar (150 pounds) of air. Whether or not you go softer is all about your weight. If you weigh around 150 pounds, feel free to drop air pressure. If you’re heavier, you’ll find that the bike is too divey in front with anything less than the recommended air setting. Almost everyone will like it with a little less compression damping. Either way, the rear shock preload should be adjusted to 105mm of sag. Like the front, the rear suspension does its job and contributes to the FC’s impressive stability. It’s just not the most comfortable bike in the world on smaller impacts. We’re not sure if the Husky and its orange counterpart will be at the top of the food chain when it comes to peak horsepower once again. The Yamaha, Honda and Suzuki all have more power for 2019. The Husky doesn’t. Having said that, we would be amazed if any of those bikes have improved so much that it can top the Husky in a straight-line race. We already know that none of them are lighter. The Husky weighs 219 pounds without fuel, and most of the others are 10 pounds heavier. So, will it be another year of the Husqvarna standing almost on the top of the podium, just slightly in the shadow of the KTM? Perhaps, but the 250 class is the hottest battleground this year, and there’s no telling what will happen until it happens. 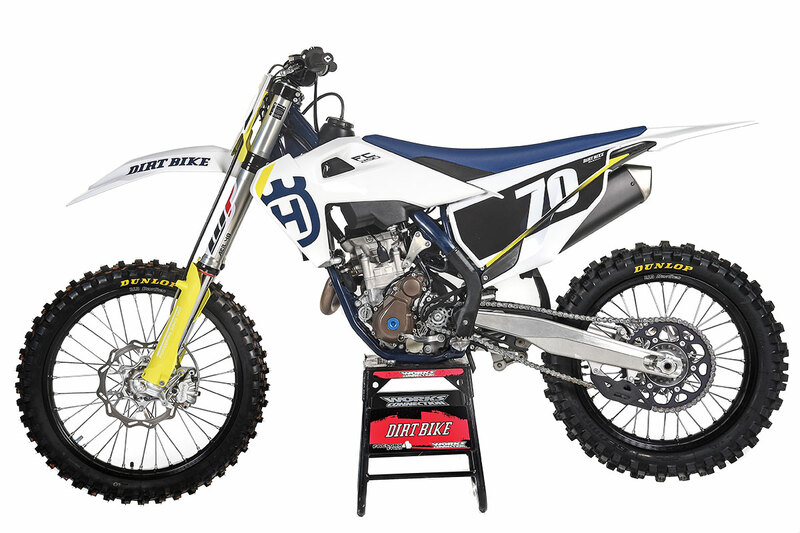 For a Dirt Bike video featuring the 2019 Husqvarna FC250, click here. Running weight, no fuel: 219 lb.